Yesterday the 118th running of the Boston Marathon was held. It is the most famous marathon (26.2 miles) in the world. The race was won by American Meb Keflezighi. It was the first time since 1983 that an American won the grueling test of endurance. 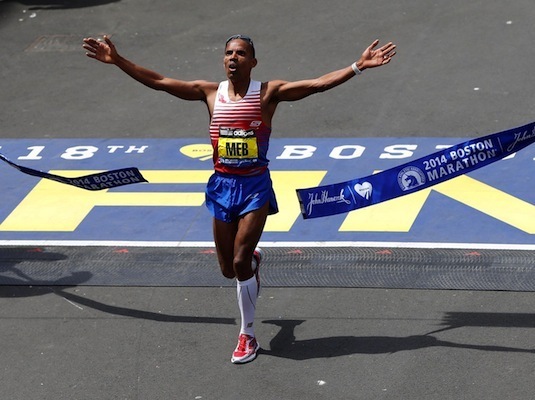 Meb’s story is truly remarkable and inspirational. Born in Eritrea, he and his family were refugees who came to the United States in 1987 when he was 12 years old. He began running in middle school and quickly showed great promise. Attending UCLA on a track scholarship, he won four NCAA championships. In the fall of 1996 I was privileged to watch Meb win the NCAA Cross Country Championships which was held in South Carolina. After the race I had my picture made with him and got his autograph. He became a naturalized citizen of the United States in 1998. He went on to capture for the USA a silver medal in the 2004 Olympics. Though his running career has been filled with much success, he has also had his share of disappointments and injuries. In an interview after the race he stated that after the Boston bombings at the 2013 race he made a vow to dedicate himself to win Boston, believing that it was only right that an American win in 2014. At almost 39 years of age that was no small task. For a solid year every time he laced-up his shoes to go run was for the purpose of winning Boston as an act of redemption for the Boston people. His thoughts, his actions and his focus were on winning Boston, a race an American had not won in 31 years. But his intentional focus resulted in a victory that wasn’t assured until the final half mile, winning by 11 seconds. His winning was like the ending of beautifully scripted movie, turning last year’s tragedy into this year’s triumph. He went on to say in a post-race interview, “I did not run for myself. I ran with last year’s victims in my heart. What I did, I did for Boston. My victory was for them all. My victory was their victory. What I did I give back to the city of Boston.” Meb’s Boston win and unselfish gesture to the city will go down in running folklore history. Our Holy Father, as well, planned for victory in regard to man’s sinful condition (Romans 3:23). Sinful man needed someone to bring redemption to him. What would the Father do? Our God didn’t send a third party to provide for us that which we could not provide for ourselves, He came Himself. Paul writes, “God was in Christ reconciling the world unto Himself” (2 Cor. 5:21). His whole purpose in coming was for the redeeming of sinful man. His whole focus was on offering a Sacrifice for us which we could not offer ourselves. He came to meet the Holy demands of God for us and assume our responsibility for the judgment we deserve for not complying. Our God not only gave the Sacrifice, in Christ He was the Sacrifice! When He went to the cross He carried us in His heart. On Calvary’s hill of death Christ turned tragedy into triumph. When Christ offered the Sacrifice of Himself on the cross He did it for us all. When Christ arose from the dead he did it for us all. And the marvel of it all, His victory is our victory. We are partakers of all that Christ came to do and accomplish. We enter His victory by embracing Him in faith. Christ won for us more than a laurel wreath that will eventually whither and crumble. The Bible says, “For you know the grace of our Lord Jesus Christ, that though he was rich, yet for your sakes he became poor, so that you through his poverty might become rich” (2 Corinthians 8:9). He won for us righteousness, forgiveness, mercy and grace, reconciliation with the Father, adoption into the family of God, freedom, peace, access to the Father, the Holy Spirit, and spiritual riches and an inheritance that is incorruptible, undefiled and fades not away” (I Peter 1:1-5). Christ did not come for Himself, but for you and me. His living was our living. His dying was our dying. His resurrection was our resurrection. His victory was/is our victory. Meb’s victory was sensational and inspirational, but in a few days his accomplishment will move from the front pages of the newspapers and will eventually fade into running history. However, what Christ came to do and did for all humanity will forever remain in the eternal-present and will forever remain on the front page of God’s eternal Word. And let us lift our voice in thanksgiving that what He did He did for us all.